To share or not to share? Bedrooms, not beds that is! Some of us have a choice and others have children sharing bedrooms as a necessity. 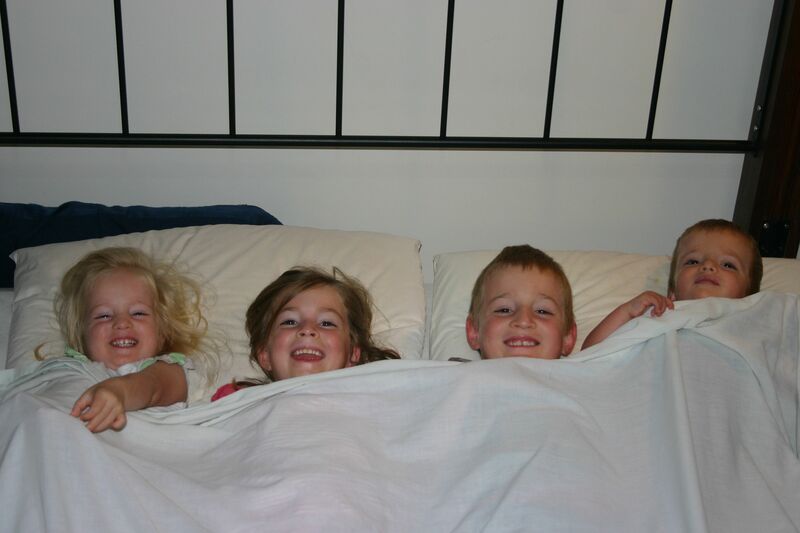 Over our parenting years we have experienced both – siblings in separate rooms and bunking in together. closer relationships and bonding between brothers and sisters as they share their space together. a sense of responsibility and big brother/sister pride (in a good way) as the older children take care of younger siblings. We heard a great story a while back about a younger child who thought of their older brother as his ‘guardian in the ceiling’ during the night. My eldest son commented at the time that he couldn’t wait to be his little brother’s guardian. a sense of security. Our children dislike being in their rooms alone now if a sibling is away for some reason and are much happier sharing . character flaws come to the forefront and need to be dealt with! It doesn’t sound like a plus but it really is. Children who have their own little private world can hide a lot of selfish attitudes and other problems because they are not challenged in this area. My children’s flaws are out there on display! Hopefully these will be much improved in the long run because they are forced to face them and work on them now. Learning to share your space and respect others is a skill. extra room. We know families who choose to have several siblings sharing in each bedroom so they can use another bedroom as a toy room, computer room, office etc. to give the family more living space during the day. For some, the bedroom is simply that – a room for beds and sleeping and nothing else. The family is then together in the common spaces of the house which leaves no problems with a child (particularly a teenager) isolating themselves from the rest of the family. changing sheets on top bunks. sorting out fights over who made the mess and who should be cleaning it up. proactively managing our morning routine right from the time a child first moves from their cot into a big bed. See this post on moving to a big bed and managing morning routines for a full explanation of how we do this. teaching children to respect each other’s belongings. They are not allowed to take their brother or sister’s personal items without getting permission first. ensuring that every child has their own space and some belongings that are off-limits to others. Each child has a private area in the form of a desk and shelving, bookshelves or cupboard. Sometimes this space is in their bedroom, sometimes in another room. staggered bedtimes so hopefully the first child is asleep or at least very dopey by the time the second gets to bed. allowing some quiet talking in the dark for a short period after lights out. (Also a great way to build positive relationships between siblings.) One of us will say goodnight and turn out the lights. The children are allowed to talk quietly to each other until the second parent comes to say goodnight, then quiet is expected. playing an audio bible CD, an audio story or music on a portable stereo very quietly so that they have to be quiet to hear it. setting consequences for those who simply won’t stop disturbing the other child(ren.) Sometime this does mean chastisement, but we have also used other consequences such as the offending child having to pay back sleep time lost with interest! This can take the form of a compulsory nap the following day, going back to bed during play time the next day or going to bed much earlier the following night. 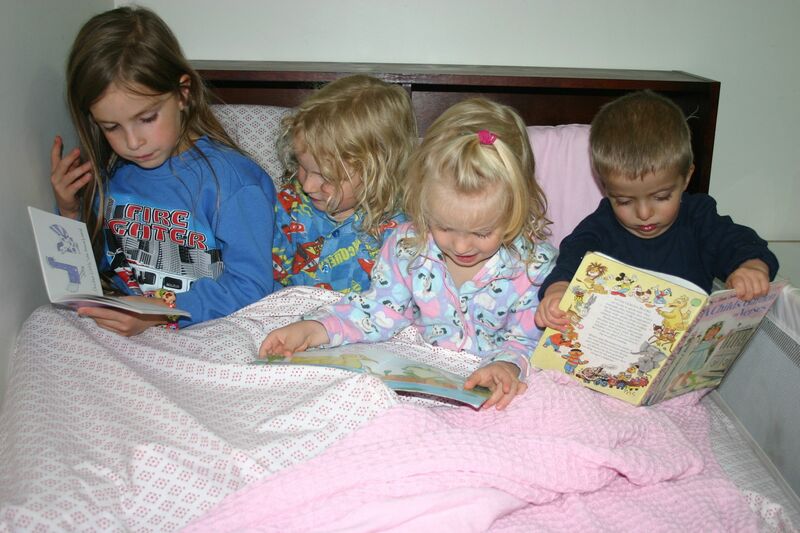 Children who wake others up in the morning may also pay back sleep time, be chastised, do all the morning jobs of the children they have woken up, or perhaps sit in the laundry during morning reading time instead of staying in their beds to read with the others. Ours very quickly get to the stage they want to share a room and REALLY don’t want to go back by themselves so if we have the luxury of a spare room sometimes the consequence was that they went back out alone for the night. They hate that! Make sure day sleeps are not too long (or need to be dropped entirely) so that they are ready for bed and sleep straight away. Make sure they get adequate physical exercise during the day. Ensure children drink a lot of water earlier in the day. Children who do not drink enough will have trouble falling asleep, want to drink a lot at night/just before bed and end up needing to get up repeatedly to go to the toilet (or wet the bed) later in the night. Don’t focus on getting them not to drink before bed, focus on getting them to drink in the morning and throughout the day instead. Some children (especially older babies/young toddlers) put themselves to sleep by having a little chat and sing to themselves or teddy in the dark on their beds. This isn’t a problem when they have their own room but it does drive older children who are trying to sleep crazy! For us it really did seem to be more a developmental stage than outright disobedience – a voice control issue rather than defiance. Working on voice control during the day by having some set times where they read books or do an activity when they are not allowed to speak helps with this. Some people say that having children sharing right from the beginning eliminates many problems. We have never done this, always having our babies in their own rooms so that they do not disturb other children when waking for feeds. Each child has transitioned to a big bed around the 2 year mark (a few months before the next baby arrives) and so far we have always had the luxury of this being in their own room. We can then work on staying in bed, morning routines and all the rest without disturbing older children. They shift into shared arrangements somewhere between 3 and 5 depending on the arrival of subsequent babies! We will eventually run out of space to do this but so far so good. The blessing we have received in our many children far outweighs the inconvenience of having to share bedroom space. After all, God tells us that children are a blessing. He doesn’t mention needing their own room as a prerequisite to welcoming a large family! I noticed from your last point that you have so far been able to give your little ones a single room until they are 2 or 3. Perhaps I just need to keep my boy in the homeschool room for a good deal longer. I would rather not, as several times a year, we have to go away for work, and we often to share rooms as a family, or at least all kids together.